From Natalie Portman's tearful acceptance speech to Anne Hathaway and James Franco's song and dance, see ALL the best bits from last night's ceremony, here! From pregnant Natalie Portman’s tearful acceptance speech to Melissa Leo’s accidental F-word, last night’s 83rd Oscars were nothing if not eventful. And if you missed out on all the on-stage action, we have a treat in store. We’ve got our hands on a special sneak peek of all the ceremony’s best bits, so you can watch the highlights from the night, here. 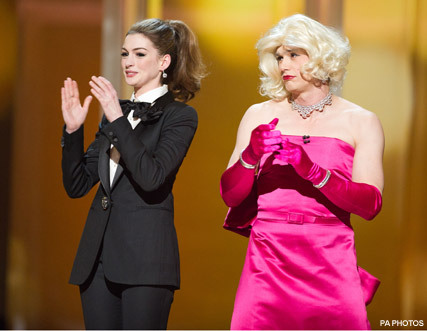 After releasing a series of hilarious spoof videos, we know cheeky twosome Anne Hathaway and James Franco didn’t plan to take their presenting jobs too seriously. And from a hilarious opening Inception skit, to a comedy musical number, and record number of costume changes, the pair definitely didn’t disappoint. The evening’s acceptance speeches proved even A-listers suffer from nerves, with pregnant Natalie Portman giving way to tears, Melissa Leo accidentally turning the airwaves blue, and Colin Firth making a (slightly strange!) joke about having the urge to dance. And there was not a wardrobe malfunction or celebrity spat in sight, as organisers worked tirelessly throughout the ceremony to ensure things ran smoothly. After the ceremony, Hollywood’s finest made their way to one of the glittering Oscar-after parties (Vanity Fair, Elton John’s or the Govenors Ball), to end the night in style. What are your thoughts on last night’s winners? Let us know in the comments box below. SEE ALL THE STARS AND STYLE HERE!